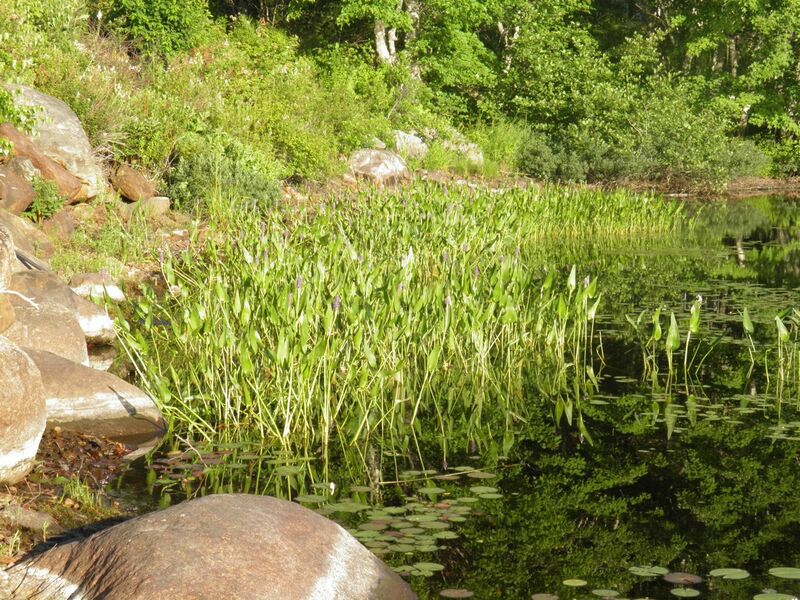 Pickerel weed, reflected in the still water of Ponoque Lake. 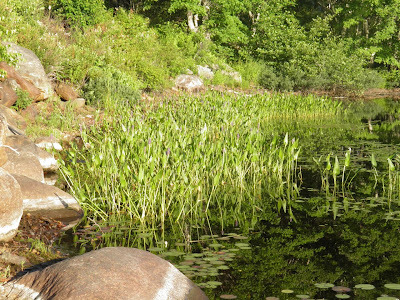 This plant is as common in Nova Scotia as the white, fragrant water lily. In fact it almost always grows in the same location. I remember this plant from when I was very young. Oddly, I didn’t know its proper name until I researched this post. 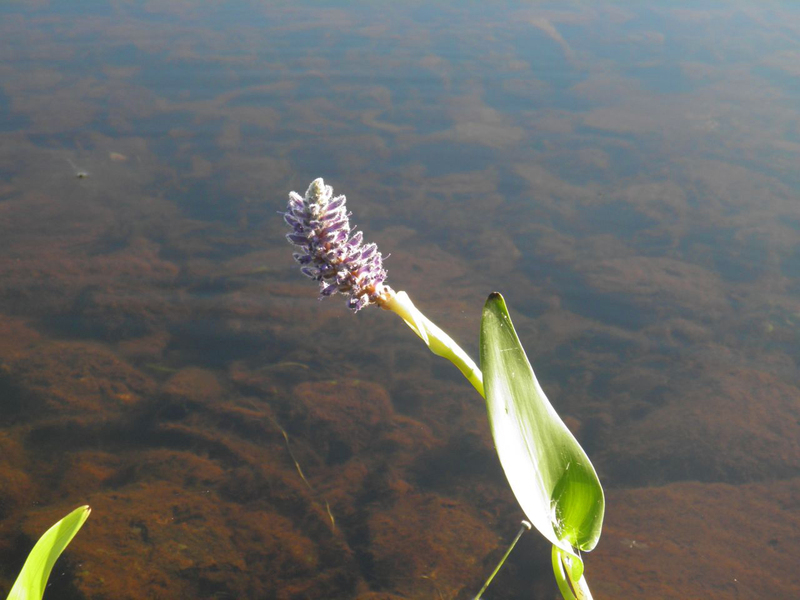 Pontederia cordata, commonly known as Pickerel Weed (or Pickerelweed), is an aquatic shoreline plant native to the Americas. It has an extremely wide range – from eastern Canada south all the way to Argentina. A flower stalk in bud, but not opened. 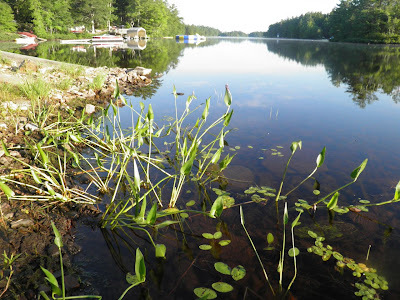 Pickerel Weed grows in flooded conditions, so the plant is generally dependent upon aerenchyma (spongy holes) in the stem to carry oxygen into the roots. It is often found in areas where water levels rise and fall over the seasons, like lake shores where fall, winter and spring water levels are much higher than in summer. The plant flowers in mid to late summer in Nova Scotia. The purple flowers bloom on what is called an inflorescence. Inflorescence is the botanical term used when small flowers bloom in clusters. Once the flowers begins to produce seeds, the stem bends to submerge the heads. This is the same trick employed by water lilies that pull their pollinated blossoms below the surface to develop. Interestingly, there is great variety in the style of the flowers and leaves, not only within the species, but also within the same colony. Although the plants do reproduce by seed, they also can spread through creeping rhizomes. They often form large colonies long the shoreline. The seed can also be dried for long-term storage whole, or ground into a powder. I haven’t been able to find any particular use for the ground powder form. The newly emerging stalks can be eaten raw or cooked – as can the adult plant, but young leaves are supposedly better. They can be used raw in salads or boiled or steamed like spinach. This plant is also an important source of food for wildlife, in particular waterfowl. Pickerel weed will colonize large areas if allowed to do so. Pickerel Weed makes a good ornamental garden plant, either in a home pond or even in a planter. It has actually won horticultural awards. If not grown in standing water just make sure that you have the ability to soak the entire container holding it every 3-4 days. It should never dry out entirely. If slight care is taken it should re-emerge every spring and potentially spread. Even if planted in a pond it may be wise to plant in a bucket to control what can be an invasive occupant.